You will get a chance to crew a 5-person Hunter 707 boat in the River Forth with one of our experienced sailors. 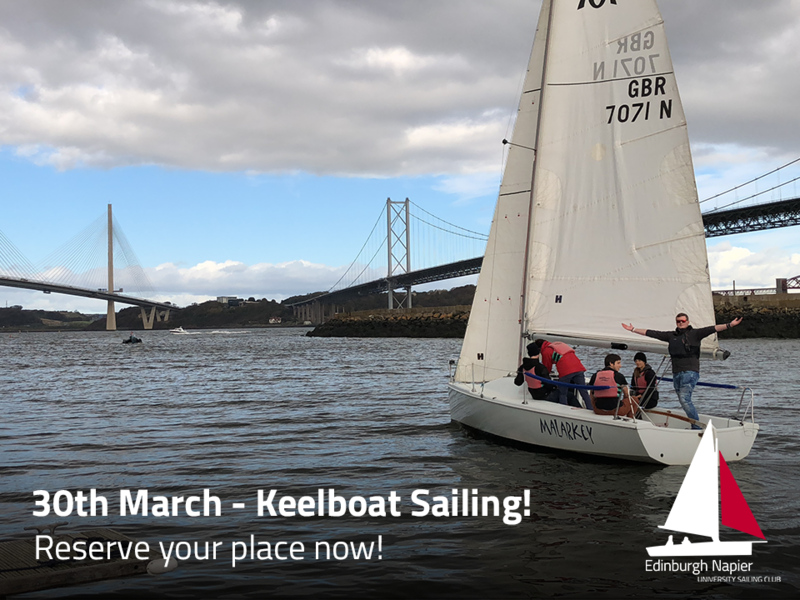 If you're new to keelboat sailing or sailing in general, we'll show you the basics and give you a chance of controlling the boat under the Forth Bridges. We will meet at 08:45 in Edinburgh to take the bus to Port Edgar, but you are welcome to come down later. We will aim to be on the water until 16:00. The session is included in your club membership (required). We will be meeting at Queensferry Street (Stop QE) at 08:45 to take the 43 bus to South Queensferry Police Station. There's a 5 min walk down Shore Road to reach Port Edgar. The ticket is £2.70 each way, so be sure to bring change or a cityWEST m-ticket. Can't make it at that time? Don't worry, come and meet us at Down The Hatch in Port Edgar any time before 13:00 and we'll take you out sailing! Message us at any time on Facebook or Instagram if you need help finding us! - A full change of clothes. Bring warm clothes! - Shoes you don't mind getting wet. - A bag for any wet stuff. - Gloves and a hat (hard wearing gloves preferably). - You may also want to bring some cash for food and coffee! If you have a one-year membership, or this is your first time sailing with us, this session is included. Otherwise, tickets are available for 10 pounds. Drop us a message on our Facebook page or email contact@napiersailing.com!